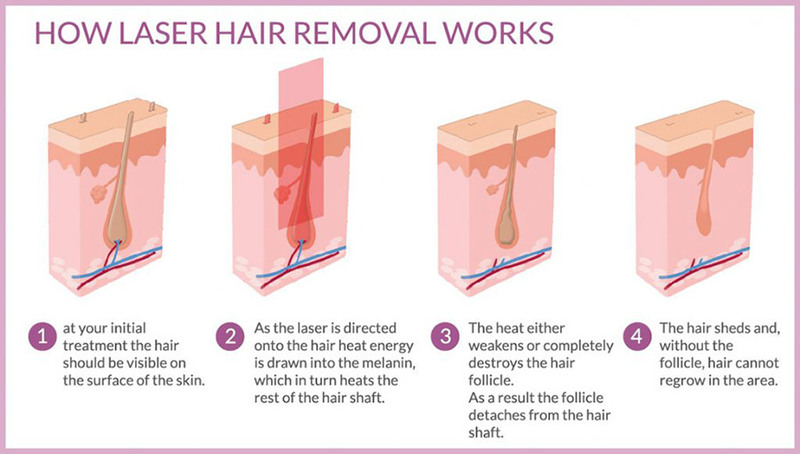 Laser assisted hair removal is currently available for the treatment of unwanted hair. The technology was developed to efficiently remove unwanted body hair over large areas of skin with as few complications as possible. Indeed, the treatment time for laser assisted hair removal is faster and less painful than electrolysis, although it is substantially more expensive. Many lasers are available for hair removal. The efficacy is dependent upon the wavelength of light used. Laser hair removal is based on the theory of selective photothermolysis. The powerful beam of light emitted by the laser passes through the skin and targets the melanin pigment that is present in higher concentrations in the hair follicle. When melanin in the follicle absorbs the laser light energy, the hair follicle is heated and destroyed, preventing its ability to produce new hair while leaving other skin structures unharmed. The ideal patient for laser hair removal has light skin and dark hair. A light skinned person with dark hair has less melanin in the skin to compete for the laser energy. This allows the laser energy to more effectively target the hair follicle instead of the skin. Patients contemplating laser hair removal should look for a physician with experience in laser hair removal. It is important that the patient have realistic expectations about laser treatments as it will remove 70 to 80 % percent terminal hair and decrease the growth of remaining hair. The patient must also realize that multiple treatment sessions will be required for hair reduction in the targeted area. Side effects are rare if the procedure is performed by an experienced person. Women with hirsutism are concerned with the removal of pigmented hair in areas visible to the public. It is important that the physician does not overlook the possibility that a patient suffers from a medical condition causing excess hair growth. Hirsutism is often idiopathic which means that the cause is not known or genetic in origin. However there are medical conditions that can cause hirsutism. These patients may have clinical features of androgenization i.e seborrhea or dandruff, acne, androgenetic alopecia, irregular menses etc. In cases in which underlying disease is suspected for example polycystic ovary syndrome, it is best to treat the underlying disease medically prior to or concurrent with the cosmetic treatment.